"Well did I come to know the presiding dryads of those trees, and often have I watched their wild dances in the struggling beams of a waning moon—but of these things I must not now speak. I will tell only of the lone tomb in the darkest of the hillside thickets; the deserted tomb of the Hydes, an old and exalted family whose last direct descendant had been laid within its black recesses many decades before my birth." 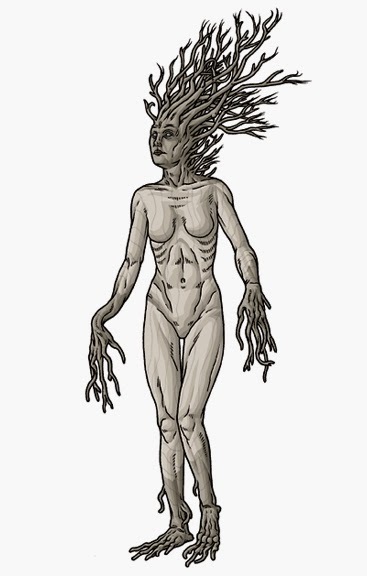 "In the classical mythology of Greece and Rome, this (Hamadryad) is the name of nymphs of the trees who inhabited and were part of the trees they protected. They are described as being beautiful females to the waist, and the lower parts of their bodies are the trunk of the tree and its roots,"
"I was much less disturbed by the vaguer tales of wails and howlings in the barren, windswept valley beneath the limestone cliff; of the graveyard stenches after the spring rains; of the floundering, squealing white thing on which Sir John Clave’s horse had trod one night in a lonely field;"
Hey guys, here's a quick update. On March 17, 1904, the American icon, Harry Houdini, accepted a challenge from London’s Daily Illustrated Mirror to attempt an escape from a special set of handcuffs that had taken five years to make and that “no mortal man could pick.” From within his “ghost house,” that sat on the stage, Houdini spent an hour attempting to escape these cuffs, stepping out now and again, once to remove his coat, other times to clear his mind. At one point during the event, he stepped out to greet his loving wife who had come onto the stage to give him an encouraging kiss. Long after his wife’s appearance on stage, Houdini emerged free from the cuffs, and cried in front of his audience, exclaiming that this had been his most difficult challenge to date. Although it had taken him awhile to emerge uncuffed after his wife’s kiss, the rumor spread that she had smuggled him the key in her mouth. The rumor about the key has never been proven. The item was too large to have fit in the lady’s mouth, so it’s not likely to be true, yet the strength of the romanticism surrounding such a story has allowed it to endure. Houdini’s entire career revolved around such dramatic mysteries, his charismatic ability to engage his audience and, of course, to escape the inescapable and endure the unendurable. Houdini was a superman of his time; a man who accomplished the impossible in front of the wide eyes of the immigrants, poor and underdogs with whom he felt akin. His stunts were astounding in and of themselves - even his doubters couldn’t look away from him - yet his entire career and persona were metaphorical, symbolizing “...freedom to those seeking release from religious and political oppression,” offering a way of escape to all who felt trapped in an unfair life. 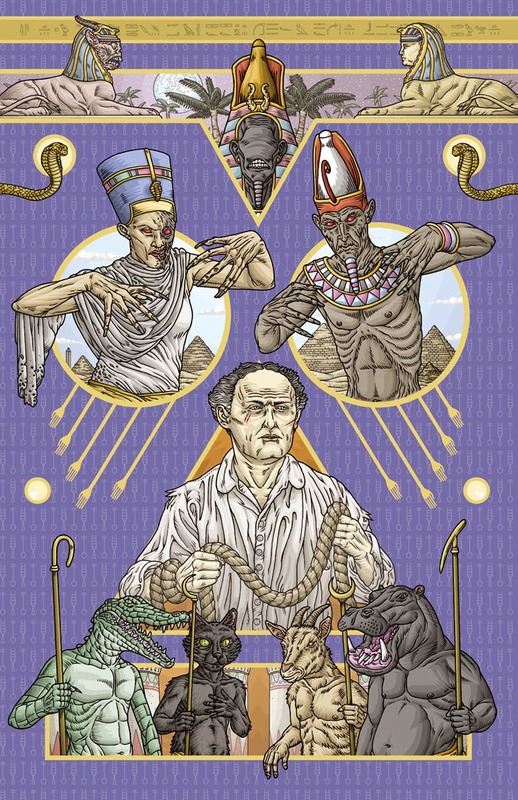 The Elusive Key is a group exhibition of artworks that celebrate the mystique and hope that surrounded Houdini everywhere during his life, and 88 years after his death. Scheduled to take place around the 110th anniversary of the Mirror handcuff escape, this show is an exhibition of magic, mystique and wonder that points towards the belief that anything can happen. So if you're in NYC, North Jersey or Connecticut come visit. I'll be brooding in the corner somewhere! "Najar's smoking carcass falls and out of it pours the twitching, whirling blackness that is the Wailing Writher, its numerous mouths snapping and screaming." "Esther Marsh melts into a steaming pool of primal fluids and is horribly absorbed by the towering column of wriggling worms and shrieking mouths that is the Writher." 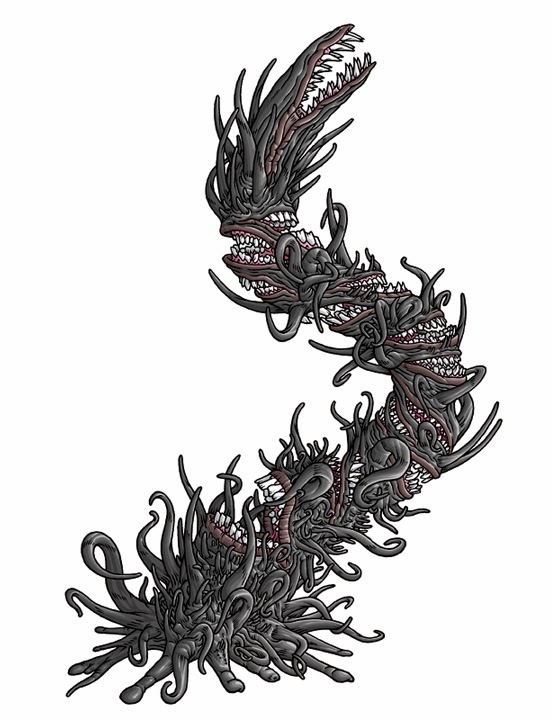 "The Wailing Writher manifests itself as a towering, swirling black mass of dripping, squirming tendrils and drooling, shrieking mouths. Millions of rope-like tendrils constantly wriggle and squirm, giving the avatar the appearance of a great column of black worms. 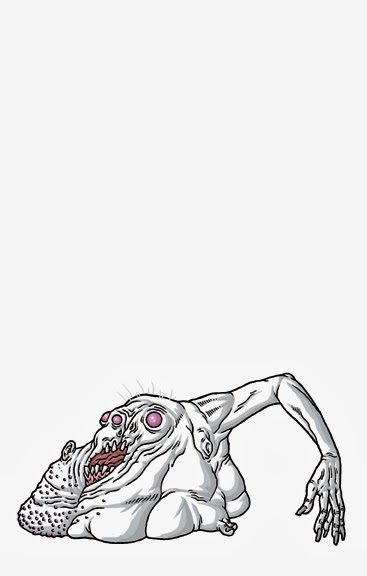 The Wailing Writher is mentioned in some very obscure Hindu myths, although it has no known cult among humans." "The model next to it wears a green silk ceremonial robe from Negri Sembilan, most rugged of the Malayan provinces. Note central motif of native man blowing ceremonial horn, and the graceful curve of his instrument; the figure is believed to be a representation of "Death's Herald", possibly warning villagers of approaching calamity. Gift of an anonymous donor, the robe is probably Tcho-tcho in origin and dates from the early 19th century." "INT: This Malay youth has sketched a picture of a demon he calls Shoo Goron. (To Boy) I wonder if you can tell me something about the instrument he's blowing out of. It looks like the Jewish Shofar, or ram's horn. (Again to Boy) That's all right. No need to be frightened. BOY: No horn. Is no horn. (Weeps) Is him. 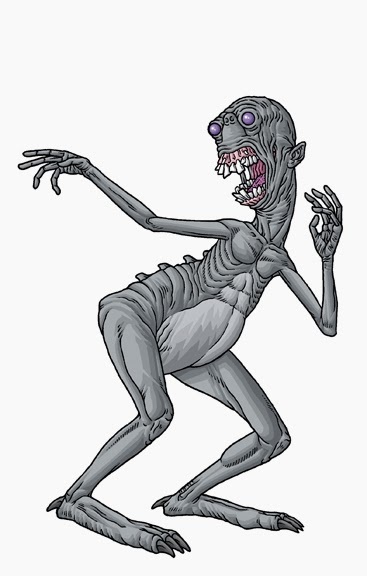 ...Despite the richness and variety of their folklore, however, they have nothing akin to the Malay shugoran, a kind of bogey-man used to frighten naughty children. The traveller hears many conflicting descriptions of it, some bordering on the obscene. (Oran, of course, is Malay for 'man', while shug, which here connotes 'sniffing' or 'questing', means literally, 'elephant's trunk'.) I well recall the hide which hung over the bar at the Traders' Club in Singapore, and which, according to tradition, represented the infant of this fabulous creature; its wings were black. Shortly after the War a regimental surgeon was passing through on his way back to Gibraltar and , after dude examination, pronounced it the dried-out skin of a rather large catfish. He was never asked back." "My sister only reinforced the mood when, sending me a rather salacious story she'd found in the Enquirer-about the 'thing like a vacuum cleaner' that snaked through a Swedish sailero's porthole and 'made his face all purple'. "Shortly before midnigh Mrs. Florence Cavenaugh, a housewife living at 7 Alyssum Terrace, Cutter's Grove, was about to close the curtains in her front room when she saw, peering through the window at her, what she described as 'a large man wearing a gas mask or scuba outfit." "Local police favor the 'scuba' theory, since near the window they've discovered footprints that may have been made by a heavy man in swim fins." and I at last understood what real evil was. "It’s an interesting book Mr. Peel. 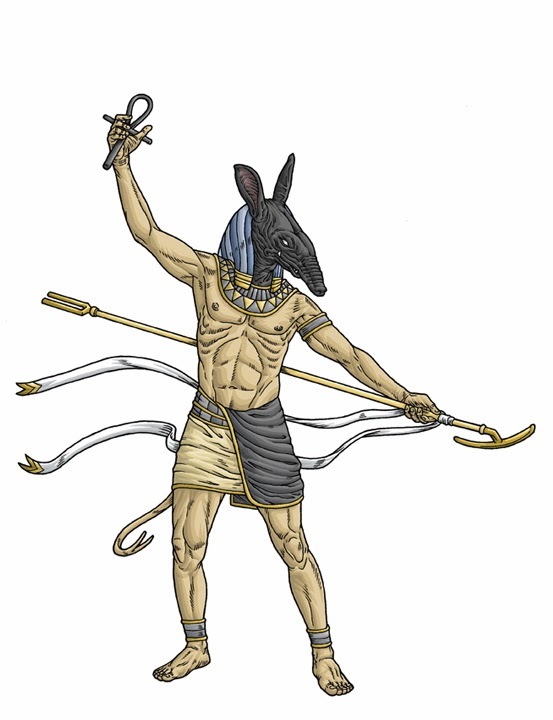 Five hundred fables, most of them concerning a dark god called the Masked Messenger, Nyarlathotep, and how she offers power and salvation to those who ask for it. There is, of course, always a price." "In his small, dull room, he could make out that one of her eyes was covered with a white film. She was properly and modestly veiled, even though it was inappropriate for her to be in the company of a strange man unescorted." "Acid perspired from her pores, dissolving the fabric of her robes and the car seat, but never enough to completely erode either. She smelt like drain cleaner. "Outside the hot wind gathered, swirled her robe about her slender form as if it were a living entity. She continued to drip acid, an endless supply carving canals in her flesh. Where the acid fell upon the sand, glass formed." Now the Masked Messenger waited for him. 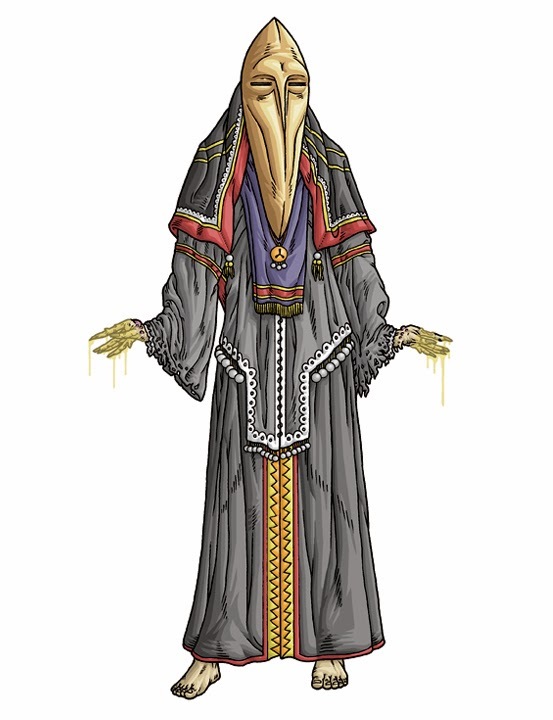 She wore an elongated mask of bronze, with two dark eye-slits and no mouth piece"
The Skinless One, an avatar of Nyarlathotep." 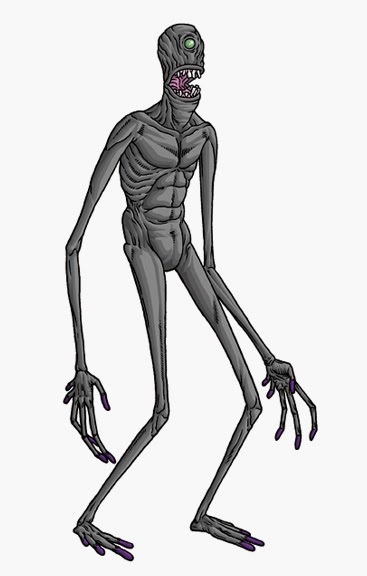 "An aspect of Nyarlathotep, it usually appears as a muscular eight-foot-tall human without skin, and sometimes a third eye in the center of the forehead." "The Sedefkar Scrolls are bundled rolls of flayed and treated human skin, cut into rectangles nd stitched together." "Unknown to Malachi Kloss and many others. 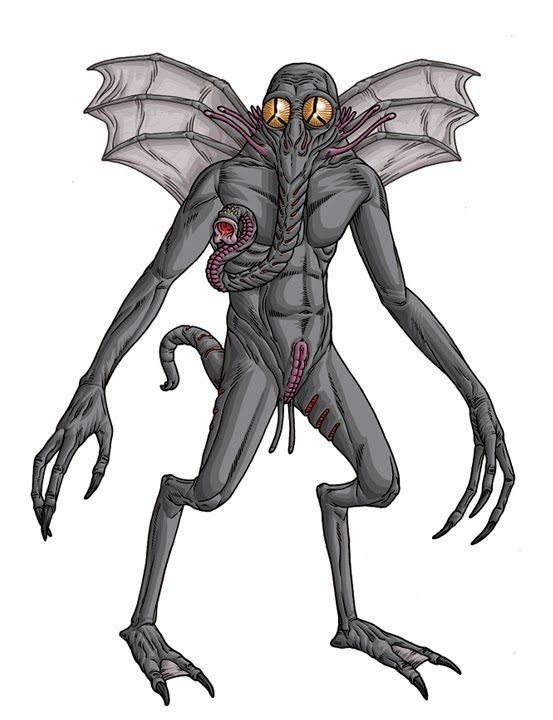 Set is one of the many forms of Nyarlathotep, who, in this form, has been worshipped for thousands of years." "Set appears as a 20 foot tall, muscular man with the head of a black dog or jackal. He wears a black tunic and sandals, while the jewelry he wears is all of onyx." 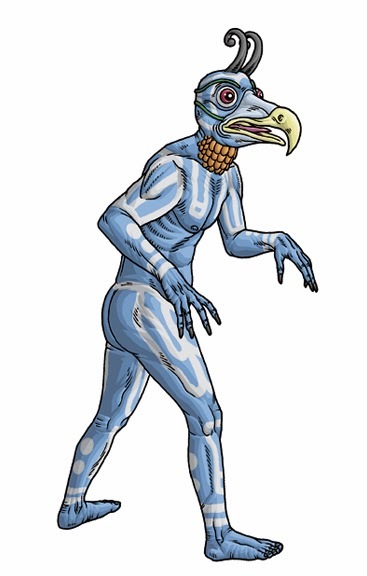 "Set was represented by the so-called Typhonian animal, or wore its head on human shoulders. This strange animal with a long curving snout, square upstanding ears and upright tufted tail has not been identified." "No use, either, to point out the even more startlingly similar belief of the Nepalese hill tribes in the dreaded Mi-Go or “Abominable Snow-Men” who lurk hideously amidst the ice and rock pinnacles of the Himalayan summits." "Yetis are not white, except in myth, mostly Western myth. Traditionally, in Nepal, Sikkim, and Tibet, close up sightings of Yeti describe their color as the basic primate blacks to brownish reds. 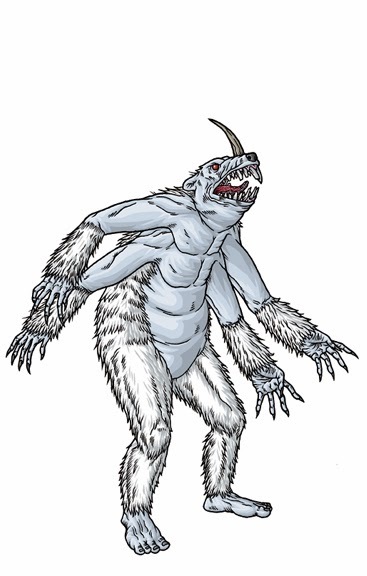 It seems that as soon as the mistranslation to “Abominable Snowman” occurred in the West, the notion has been that these cryptids are white. It is an unfortunate mistake that is still being made with Yeti toys and souvenirs. And art." "Perhaps the most widely celebrated of the elusive wilderness monsters is the so-called Abominable Snowman-or as Nepal's mountain-dwelling Sherpas say, Ye-teh or Teti-whos tracks have been often discovered in the frigid lands of perpetual snow in the Himalayan regions of India, Nepal, and Tibet." "In 1889, Waddell found what he took to be large footprints in the snow on a high peak northeast of Sikkim." 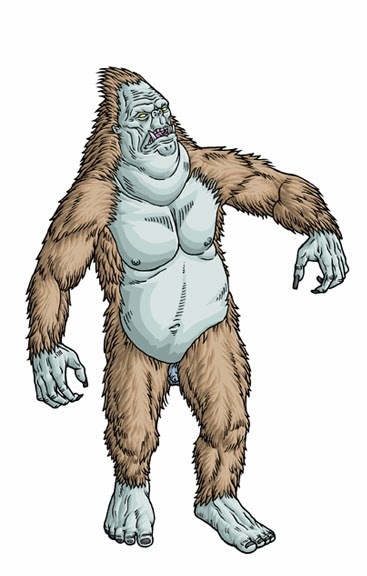 "Described as having pointed heads, long arms hanging below the knees and covered in reddish hair, the Yeti would seem to be a smaller version of North America's Bigfoot, though most investigators insist that the two creatures are entirely different." "A small bulge in the canvas far to the right suggested the sharp horn of Gnoph-keh, the hairy myth-thing of the Greenland ice, that walked sometimes on two legs, sometimes on four, and sometimes on six." "These creatures, I said to myself, were to the men of the nameless city what the she-wolf was to Rome, or some totem-beast is to a tribe of Indians." "The word (totem) is from the Algonquian and signified originally a brother-sister blood relationship. As used by anthropologists, it may denote any one or all of a number of related concepts and associated customs stemming from the nuclear idea of a blood covenant between the human and the animal species. Primarily, the anthropological term denotes (1) a mythological identification of the ancestor of a given human family, clan or tribe with the ancestor of some local animal species; but it has also been used to signify either (2) the identification of some particular animal with the guardianship or heraldic sign of some social group or class or (3) the recognition of some particular animal as the guardian, servant, or alter ego of an individual-which is more properly known as nagualism, from the Nahuatl noun nahualli ("sorcerer"). presence of Satan and his imps;"
"In the folk beliefs of Europe, this is a mischievous little devil, devilet, or minor fiend that is often described as being the childlike offspring of the Devil." "Once more I ventured within those brooding ruins that swelled beneath the sand like an ogre under a coverlet, and again dug vainly for relics of the forgotten race." 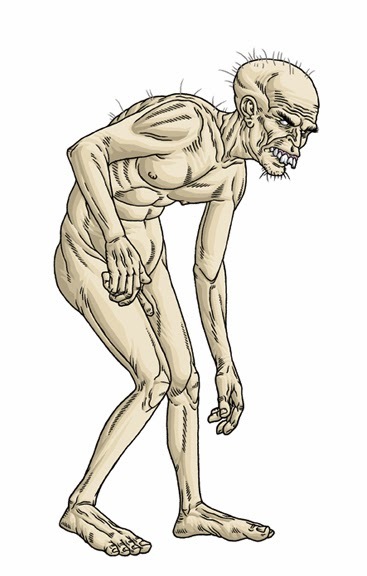 "This is a name given in folklore to a particular class of giant. In general an ogre is a gigantic humanoid male of verly little intellect, enormously strong bulk, cannibal tendencies, and easily outwitted by a clever human."